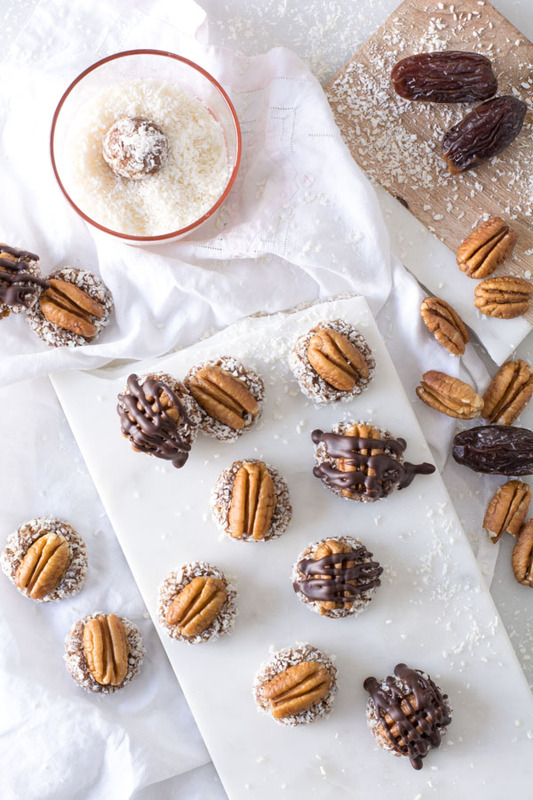 Coconut Pecan Date Bites are a quick and easy healthy little treat. 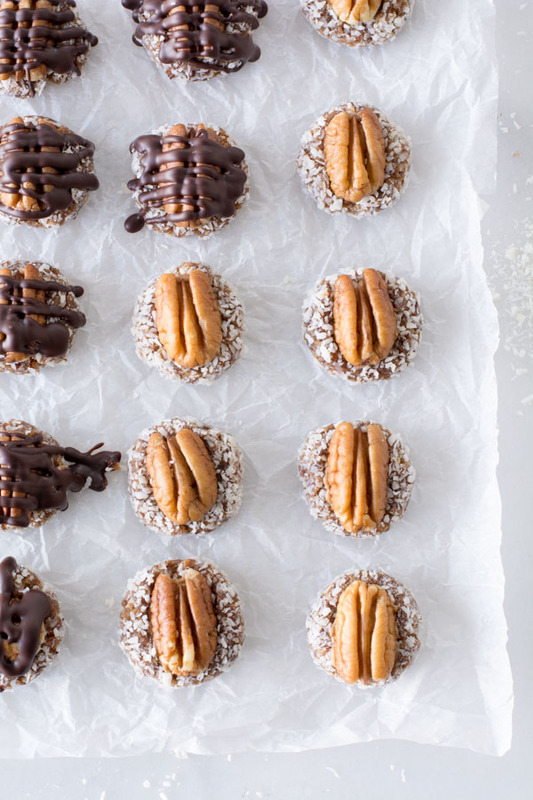 They are sweetened with dates and made rich with almond butter, coconut, whole pecans with a chocolate drizzle. 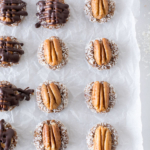 Because dates have a subtle caramel-like taste and soft chewy texture, they are perfect for blending and mixing to create wonderful little bites that will satisfy any sweet tooth. If I had to pick a favorite food, it would be cookies! I LOVE cookies. They are a quick grab-n-go snack. I have eaten cookies for lunch a lot! Cookies are a great handheld dessert. I have been looking for healthier alternatives to cookies but was it possible to find anything as satisfying? 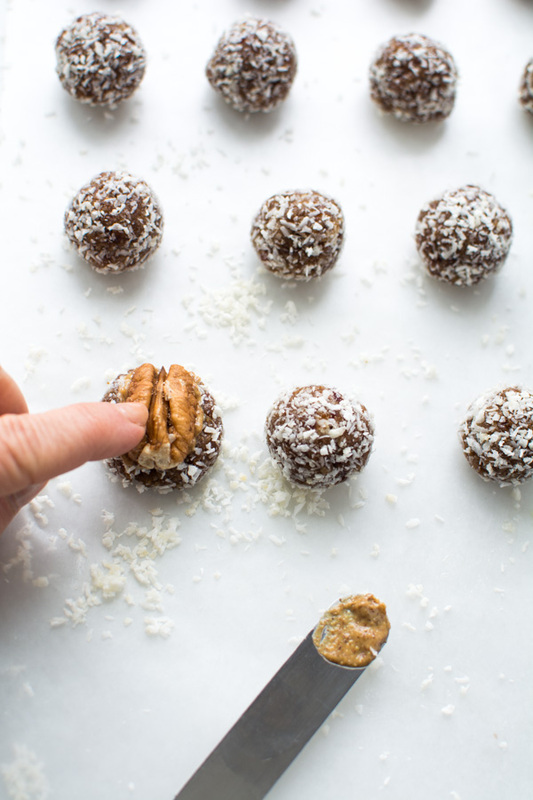 Move over oatmeal chocolate chip and say hello to these healthy little Coconut Pecan Date Bites. Dates are very nutritious and have an impressive nutrient profile. 1) High in fiber, 2) High in disease-fighting anti-oxidants, 3) May promote brain health, 4) excellent natural sweetener. Let’s talk almond butter: A small serving of almond butter contains a generous amount of magnesium–which boosts heart health by promoting the flow of blood, oxygen, and nutrients–and potassium, important for good blood pressure and heart health. The humble Pecan is loaded with 19 vitamins and minerals. 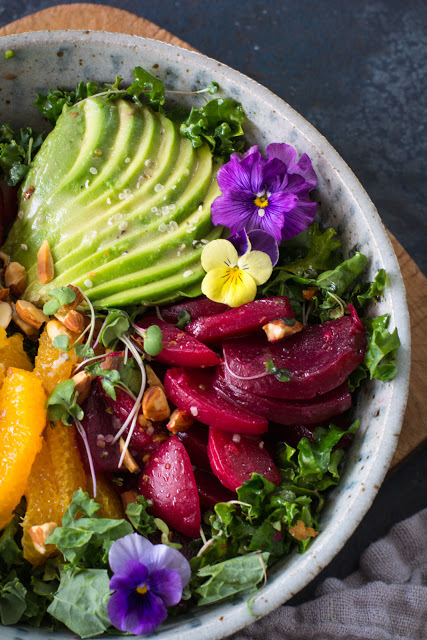 Vitamins A, B, & E. folic acid, calcium, phosphorus, potassium, thiamin, and zinc to name a few. Promotes heart health and has high anti-oxidant levels. 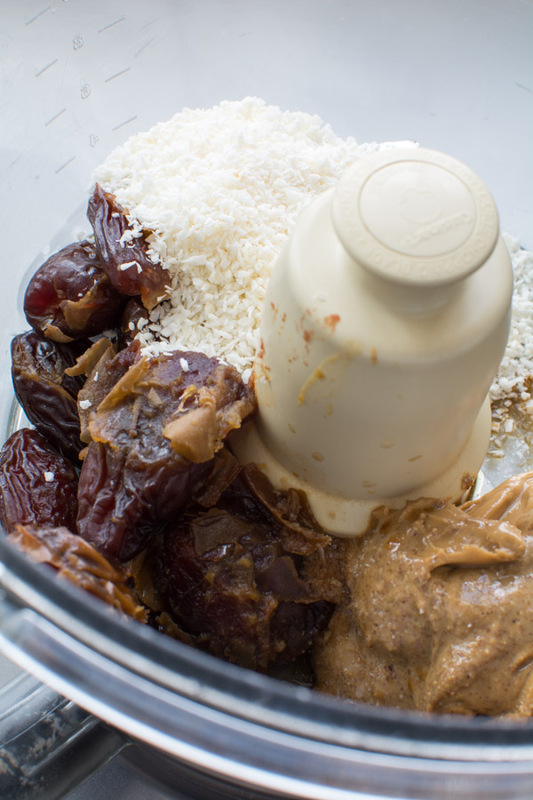 In a food processor, add dates, almond butter, coconut, salt, and vanilla. Process until mixture holds together. This should only take 2-3 minutes at the most. 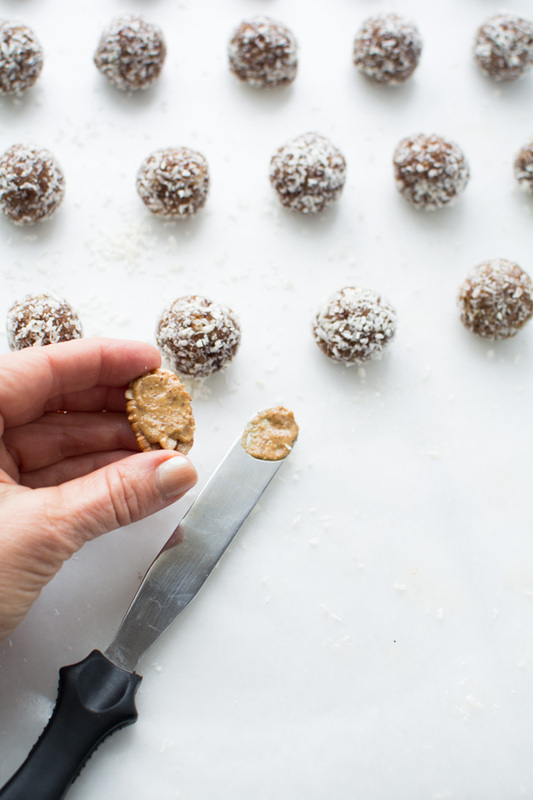 Form into balls that are less than 1 tablespoon. Roll in shredded coconut. Spread a small amount of almond butter on the bottom of pecan. 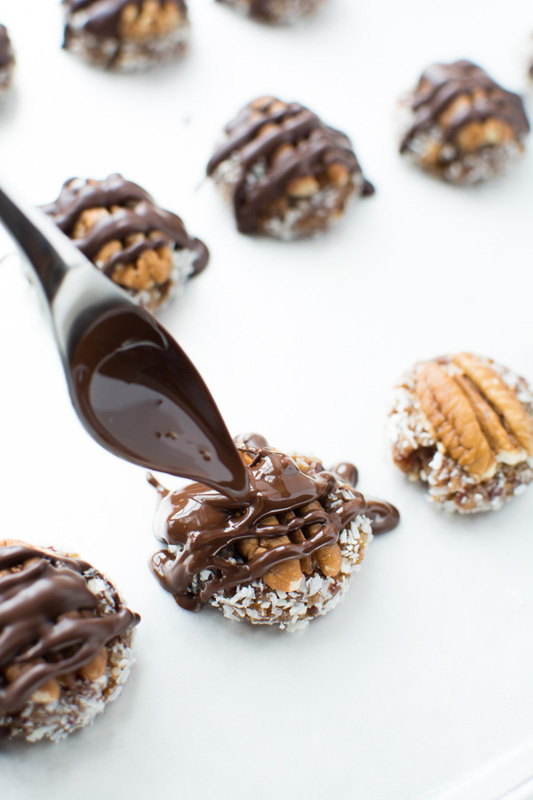 Gently press a pecan into the top of each ball. Drizzle with melted chocolate. 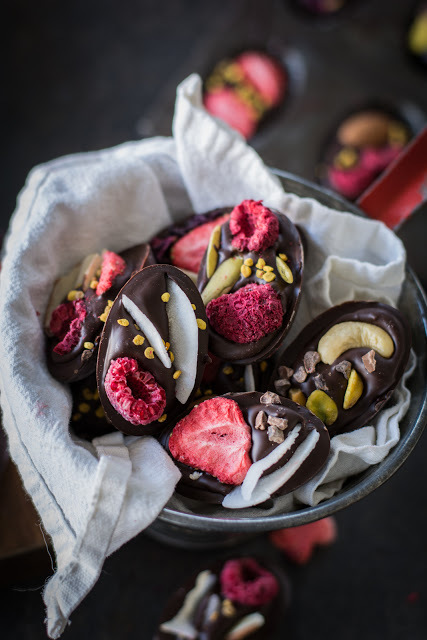 This is optional, of course, but why wouldn’t you want a little chocolate in each bite? My dates are old and hard? Soft, fresh dates are best to use, but if your dates are old or hard, just soak them in hot water until they soften up. Once they are soft remove the pits and they will blend up perfectly for this recipe. I only have sweetened coconut? 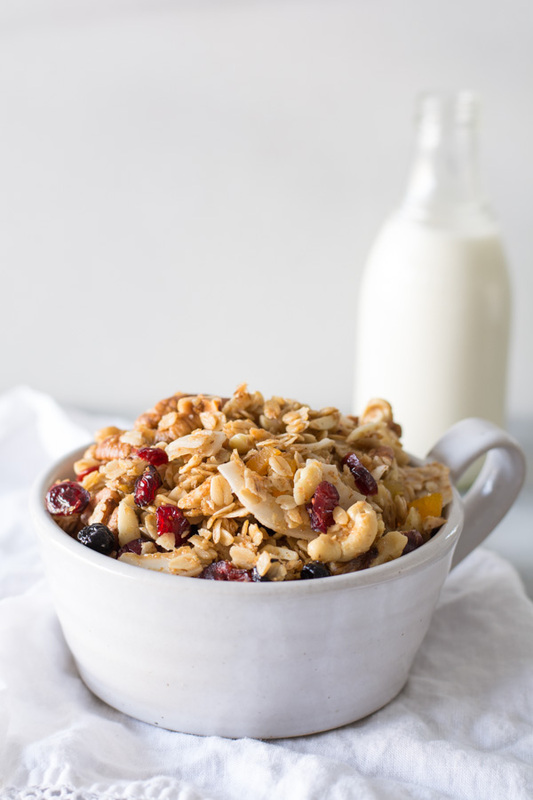 Unsweetened flaked coconut is preferred for this recipe but if sweetened coconut is all that is available go ahead and use it. I only have semi-sweet chocolate chips? Chocolate chips can be used, add 1 tsp of oil or coconut oil to 1/2 cup melted chocolate chips to help thin the chocolate so it will drizzle. I don’t like or have pecans? Any nut can be used in place of the pecan. I chose the pecan because it is a softer nut and I love them! 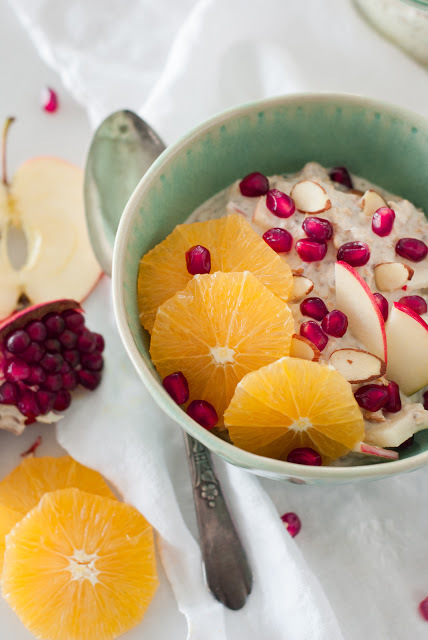 Go ahead and top with a walnut or almond or make them nut free. 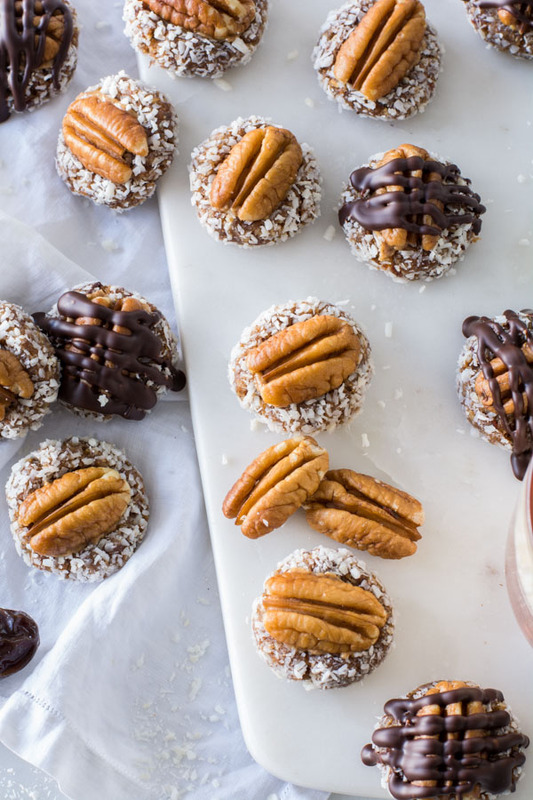 Coconut Pecan Date Bites are great naked or with a chocolate drizzle. I’m not sure that came out right. Either way, I prefer the chocolate drizzle. 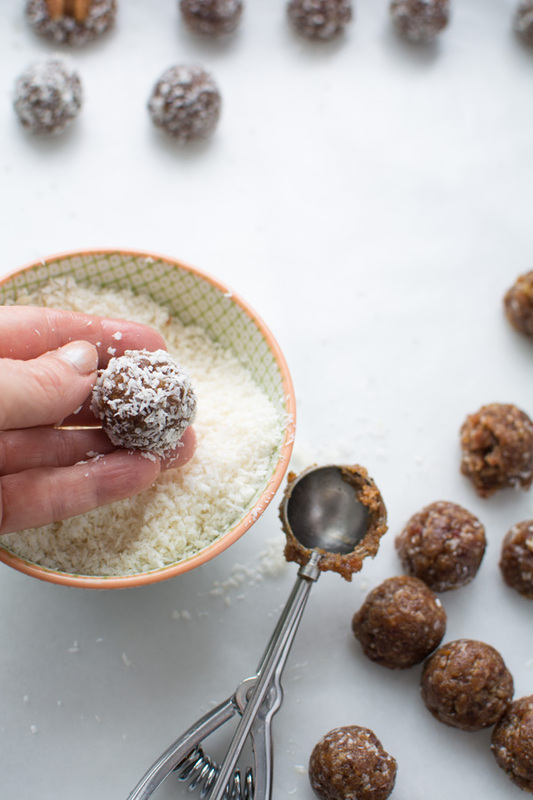 Give me 15 minutes of your time with just a few simple ingredients and you can be eating these delicious date bites that will remind you of certain chocolate covered coconut candy with an almond. Line a baking sheet with waxed paper or silicone liner. Set aside. In a bowl of a food processor, fitted with a metal blade, add pitted dates, almond butter, coconut, salt, and vanilla. Process until mixture will hold together. 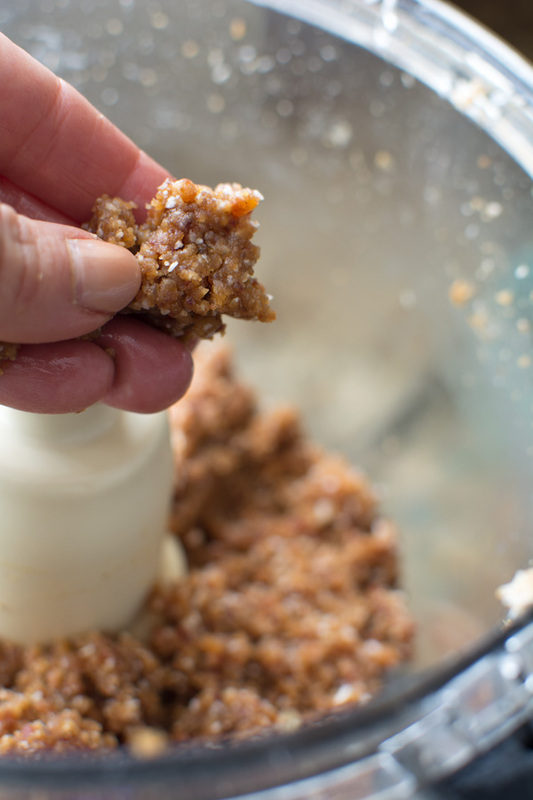 Using a little less than 1 tablespoon of the mixture, form into a ball that holds together. Roll the ball into shredded coconut and put on the prepared baking sheet. Using your finger or thumb slightly flatten the ball. Spread a bit of almond butter on the bottom of the pecan and press into the flattened dough. Drizzle with melted chocolate, if desired. Store in an airtight container in a refrigerator. Soft, fresh dates are best to use, but if your dates are old or hard, just soak them in hot water until they soften up. Once they are soft remove the pits and they will blend up perfectly for this recipe. unsweetened flaked coconut is preferred for this recipe but if sweetened coconut is all that is available go ahead and use it. Semi-sweet chocolate goes best with the sweetness of the dates for this recipe. Chocolate chips can be used, add 1 tsp of oil or coconut oil to 1/2 cup melted chocolate chips to help thin the chocolate so it will drizzle. Any nut can be used in place of the pecan. I chose the pecan because it is a softer nut and I love them! Go ahead and add an almond or walnut or make them nut free. They taste just like caramel!! So good! Thank you. I love these. I think I ate every batch that I made myself.